Impacts, large and small, have played a leading role in carving out the scenery of our solar system over the past 4.5 billion years. The process is still active today on a much smaller scale and every once in a while, we get a dramatic reminder (like Shoemaker Levy 9 or Chelyabinsk). A series of interesting talks at the 2014 Lunar and Planetary Science Conference evaluated the role of impacts in shaping our own planet. "Large impacts into eastern hemisphere of the Moon cause hours to days long impact showers on the Earth," proposed Misha Kreslavsky and Erik Asphaug in their LPSC talk in a morning session on Impact Theory and Models. What a sight it must have been for the living creatures on Earth! It must have been a spectacular show of fireworks, similar to meteoroid showers, I guess, but a little more intense and prolonged. Kreslavsky's presentation focused on "direct delivery" of lunar meteorites to Earth, something that has not been explored a lot in the past. It would be a significant scientific feat if we could identify a meteorite that could be directly linked to an impact crater on the Moon. We would know the age of the crater directly by dating that meteorite. 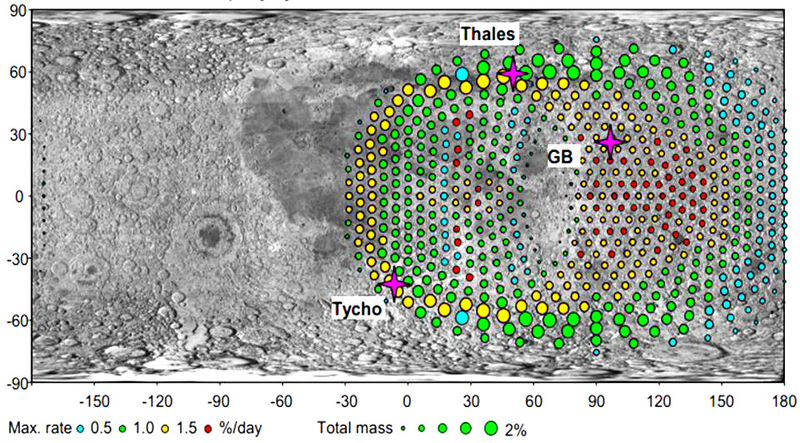 In the same vein, dating a number of lunar impact craters by dating direct-transferred meteorites would tell us the rate at which the impacts were taking place over this period. The younger part of the Moon's time scale (within the last billion years) is very uncertain. Locations which were feasible for direct delivery of impact ejecta from the Moon to the Earth. The color of the circles define the rate of delivery (red circles indicate higher rate of impact debris delivery). The size of the circles indicate the percentage of total ejected mass that is directly delivered. 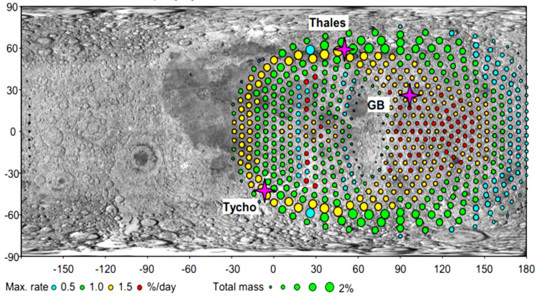 The authors carried out simulations where they launched projectiles from all over the Moon and followed their trajectory for 10 days. Impacts over most of the western hemisphere would deliver debris into orbit around the Sun, so it would not reach Earth (at least, not directly). However, impacts on the eastern hemisphere of the Moon could generate debris that would get directly transported to Earth. A maximum of 2.2% of the total ejected material is expected to be directly delivered. Although small compared to the total ejected material, it could have a big effect, especially if this material were concentrated over a small area. 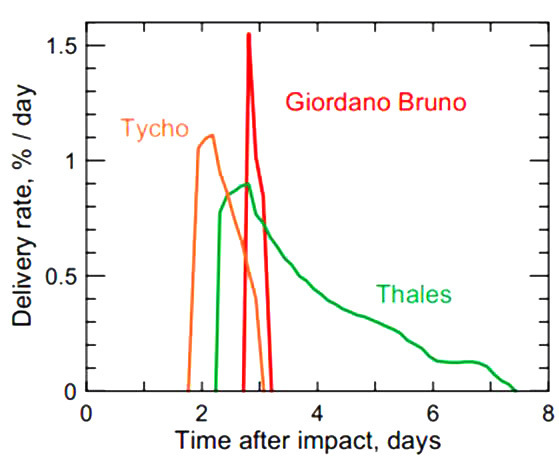 The authors proposed that impact debris from three geologically young impact craters (Tycho, Thales, and Giordano Bruno) stand a good chance to have been preserved in the terrestrial rock record (see the graph below). 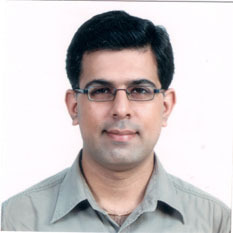 Any such finding would be valuable for understanding lunar history as well as that of the Earth. Plot showing a comparison of impact ejecta direct delivery rate and the time over which it is delivered across three geologically young craters. Note that Giordano Bruno, which is one of the youngest craters, has the highest delivery rate and shortest time period of delivery. Later in the session Ross Potter and David Kring evaluated whether it was possible that impacts in the Earth’s early history (4.5-3.8 billion years, in the Hadean period) stripped off significant portions of Earth's topmost layer, the crust. Crustal stripping could explain some geochemical anomalies on Earth, ways in which it is different from the early solar system materials that must have assembled to build it. These anomalies include high Fe/Mg ratio, high Sm/Nd ratio and low concentrations of bromine, chlorine and iodine (also called heavy halogens). Some of these differences are hard to explain by Earth’s normal evolutionary process. But after exploring a lot of variables, Potter and Kring found that impacts were not likely to strip off much of Earth's crust, unless a major part of the crust was removed in a single large impact event. They did not examine very large impacts (300 to 500 kilometers diameter), which may or may not be effective in removing the crust. The authors also suggested that we may have misidentified the Earth’s parent materials, and that the so-called "anomalies" may not actually be deviations from the normal trend. It seems we don't yet know what Earth was made from. Once in a while, a scientific prediction is confirmed by an actual observation. The last talk of the session saw this exciting culmination, when Oleg Abramov and colleagues presented thermal modeling results for the Earth during time period of intense cratering called the late heavy bombardment or LHB. It was a period of intense impact activity that happened around 3.9 billion years ago that has been documented across the various planetary bodies in the solar system. They provided a prediction for detection of this event in Earth’s zircon record. Zircon (ZrSiO4) is one of Earth's toughest minerals. Individual zircon mineral grains have survived billions of years of Earth’s history, even as they have been eroded and incorporated into other rocks. Ancient zircons represent the oldest dated material on the Earth. A) An image of the Australian continent showing the location of Jack Hills, the source of the oldest material on Earth. B) An image (taken by a technique called cathodoluminescence) of the oldest material known on Earth, a zircon crystal that has been dated to be 4.4 billion years old. Each identified bright or dark interface represents an overgrowth over original crystal and would likely have a different age. How many overgrowths can you spot? 'D' are disturbed regions. It is by dating hundreds of such zircon grains that a re-setting signal is observed around 3.9 billion years, which could be representing the effect of late heavy bombardment. Abramov tried to figure out the proportion of ancient zircon grains that may have been affected by the Late Heavy Bombardment. Considering the number and size of impacting bodies (the impactor flux), the degree of melting in Earth's crust, and the variation in temperature with depth in the Earth’s interior (the geothermal gradient), he concluded that about 600 to 800 meters of impact debris, and 800 to 1000 meters of rock vapor, must have been deposited during the Late Heavy Bombardment time period. The temperature of the debris would have ranged from 300 to 2500ºC, depending upon the size of the impactor. A point worth noting here is that age information in zircons (our old faithful record keepers) can be wiped out if they are heated above 1000 to 1300ºC. Abramov proposed that about 15% of the very old zircons from the terrestrial record (coming from a locality called Jack Hills in Western Australia) should show an imprint of the temperature effect of the Late Heavy Bombardment. And indeed, it has been documented that about 13% of the zircons from Jack Hills show an imprint around 3.9 billion years. Abramov concluded that the heating of the Jack Hills zircons recorded the signature of the Late Heavy Bombardment. In fact, a scientist in the audience was jumping with joy after knowing that he could now make sense of the deviation from major trend in his analysis of hundreds of zircon grain measurements. It likely represents the major increase in number of impacts in the solar system (including our Earth). Science, at times, progresses in leaps and bounds, and this was one small example of that moment!